This post is directly inspired by the article “Inquiry Literacy: A Proposal for a Neologism” by Shore, Birlean, Walker and Ritchie. One word serves as both societal game-changer and educational catchall. Once the domain of reading and writing, literacy now serves as the one word that sums up basically all understanding and communication about almost anything and everything. Critical literacy, computer literacy, cultural literacy – there’s a lot of literacy to go around. Regardless of the type of literacy, most would agree that until you are “literate”, in whatever sense you are referring to, it can be hard to impart that type of literacy upon another. It would, for example, be difficult for a teacher to instruct her students on reading, if she could in fact, not read. With that in mind, I would like to point out the importance of Inquiry Literacy for teachers who are attempting to cultivate an inquiry learning environment. We have many teachers, both new and veteran, at my school who are always trying to better wrap their head around inquiry. A common sentiment I hear is, “I want to use inquiry, but I am just not sure how!”. Inquiry usually gets the bum wrap of being difficult to implement. I have a hard time agreeing with this, considering inquiry is essentially the natural process of human curiosity. What is needed then is an inquiry into the process of inquiry in order to make ourselves more Inquiry Literate – is that meta enough for you? Shore, Birlean, Walker and Ritchie, in their article “Inquiry Literacy: A Proposal for a Neologism”, suggest that Inquiry Literacy is “the individual’s capacity to critically understand and use the language, symbols, and skills of inquiry, and to reflect on their meaning and usage during and after the activity”. Using this as a jumping off point, let’s take a look at how you can develop your Inquiry Literacy. We have adopted Kath Murdoch’s Inquiry Cycle as a means to ensure a common framework for inquiry at our school. 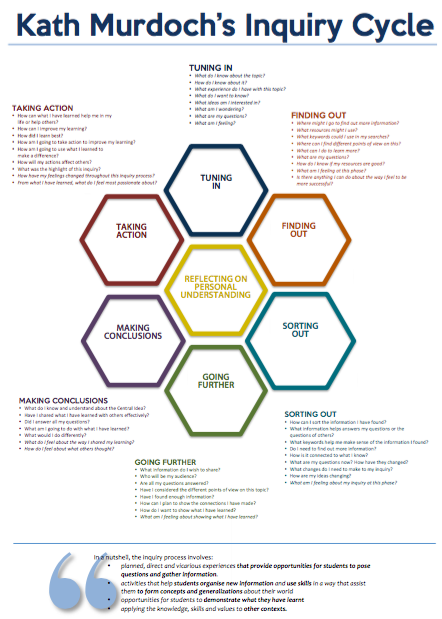 This is by no means the only framework for inquiry, but it does provide our teachers with a common language and effective questions to assist them in utilizing an inquiry based approach in their classroom. Once you have found a framework that you like, don’t just read and discard it. Use it as a template for planning the scope and sequence of your units and lessons. By explicitly using the framework of the inquiry cycle in their unit and lesson plans, our teachers are thinking using the language and processes of inquiry. Often, our teachers will ask, “Should I be using these words with my students?”. My answer is emphatically, “Yes!”. Shore et al. argue that in order to effectively inquire, “students need language, symbols, and skills of inquiry”. By bringing the language of inquiry to life within our classrooms, we solidify our understanding of this language, not to mention our students can begin consciously interacting with this language and developing their own Inquiry Literacy. Reflect on your own experiences as an inquirer. What processes did you go through when you watched that YouTube video on “How to Boil Eggs Perfectly“? What questions did you ask when you trying to figure out whether it’s better to buy or lease your new car? How did you feel when you were travelling and experiencing the sights and sounds of different culture? By making the inquiry process conscious in your mind and reflecting upon your own journey as an inquirer you will be better able to develop Inquiry Literacy within yourself and better able to understand the processes your students are undertaking in their inquiries. Do you consider yourself Inquiry Literate? If so, what steps have you taken to develop this literacy? I always wanted to change the world. Ridiculous. Respectable, but ridiculous. The world, as I’ve learned through travelling it, is a great, big, wonderful, awful and amazing place. One person cannot change the world – there’s too much world to go around. Even monumental events don’t change the world. The printing press didn’t change the world – humans use of printing press slowly contributed to the destination of knowledge, which had a significant impact on the world. The internet didn’t change the world – the internet gave a forum for the free exchange of information and allowed (for better or for worse), anyone connected to the internet to consume and contribute to a vast collective of knowledge and opinion. 9/11 didn’t change the world – it changed the way we travel, it changed the lives of millions of Americans and how they view their safety, it changed the lives of millions of Afghanis and Iraqis whose lives were abruptly altered through the retaliation of the West. Even big events don’t change the world, but they do start the breeze blowing in all sorts of directions. Sometimes that breeze is gentle and felt only by a few and sometimes that breeze builds into a hurricane that effects all those in its path. How can on person change the world? They can’t. They can only start the wind a blowin’. I’ve had a lot of careers. I’ve donned white collars and blue collars. I’ve gone grassroots and I’ve sold out. After it all though, nothing and I mean nothing, comes close to making me feel like I can cause a little wind to stir than working in education. If you are an educator like me, hopefully you know what I’m talking about. You know the feeling of seeing a small spark start within your students and colleagues. Is the spark enough to light a fire? I don’t think it’s our role to see that through; we don’t start the fire, but if we’re lucky we show our students how to gather the wood. I will admit my ambitions remain lofty, as does my optimism. I will continue to try to “be the change” as cliche as I’m sure that might sound to many…many who aren’t interested in being the change that is. The question I ask myself over and over again is – does our role as educators, within the prevalent systems of education, allow us, or our students to spark that fire? Or do we just show our students the light switch instead? Worse – do we keep our students in the dark? We are in the business of helping to create a better future – like it or not, on some scale this is possible. We are responsible then, for questioning the systems of education that prevail. For pushing the boundaries of how people define learning. For not being content with the bureaucracy that often stifles true learning, despite its best intentions. For not becoming cynical. For not changing the world, but at least trying to give it a push in the right direction. This space will look at some ways that we can disrupt our thinking. How we can help our students become agents of change through methods that might not be conventional, popular or even logical. Let’s give our students are reason to want to come to school. Let’s give ourselves a reason to keep trying to change the world.